I have a story for you for a heart stopping find I made just yesterday. I live in Kalamazoo, MI and have been metal detecting seriously for a little over a year. Just yesterday I was metal detecting in a park I found that I didn't even know existed. I was looking for parks in a new area and just asked Google to show me parks in the area, and came across it when it showed me a little, out of the way park I never knew about. I had my Garrett AT Pro with NEL Thunder coil as well as the recently purchased (from Kellyco) Fisher F22 that I got for my daughters to use. I decided to go with the Garrett. I also have a Garrett Pro Pointer AT to help locate objects in the plug or hole, and a Lesche T-Handle digger to make a nice, neat plug. Anyway, I had found the normal trash, and a few modern coins, nothing older than the 1960s, but was enjoying getting out and getting the fresh air and exercise after work. I came across a signal that was ringing up just a bit lower than the typical dimes, bottle caps, and copper pennies I had found, so it immediately got me curious. Depth was showing about 4 inches or so, so I dug a fairly small, shallow plug. The target was still in the hole so I popped out a little more dirt where the pinpointer was indicating the target was located, and I could see the edge of the ring in the dirt. As I picked it out I could see it had stones in it, and as I cleaned it off, my jaw started heading for the ground. This ring was absolutely beautiful. 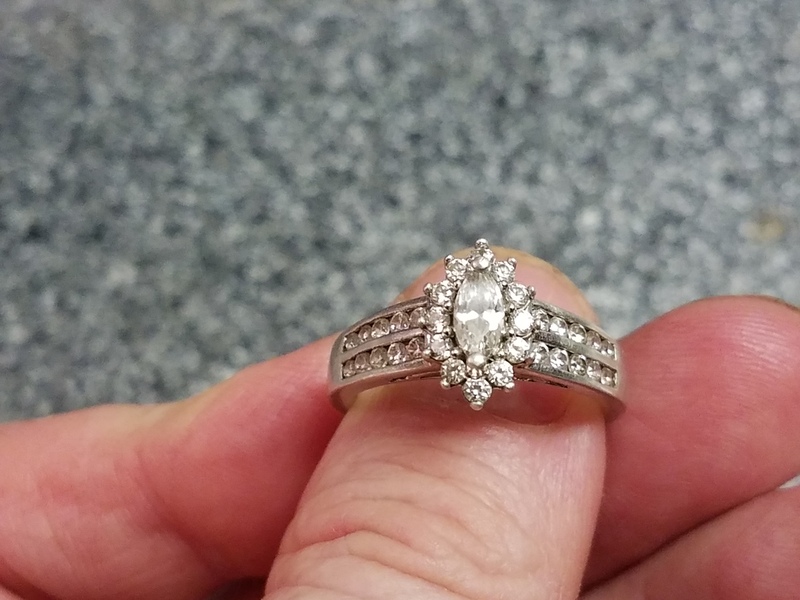 I could tell right away it was silver, and it looked like it had a large number of small diamonds and one large diamond. It was a heart stopping moment. I cleaned it a little with a spray bottle and it just kept looking nicer and nicer. I put it in a pocket until I could get home and check it out better. It did turn out to be .925 silver, but the stones weren't diamond after all. 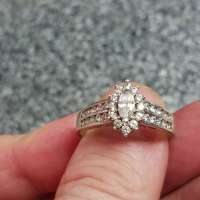 When I noticed the mark inside the ring that said CZ I was pretty sure that indicated Cubic Zirconium, and my diamond tester confirmed that the stones were not diamond. On one hand, I was slightly disappointed. I had thought, maybe I could take the kids on a really special vacation now! On the other hand, I was relieved because I knew, if it had been diamonds, then at some point in time, someone had suffered a huge heartbreak from losing such a beautiful piece of jewelry, and I didn't like the thought of that. I still think it's an absolutely gorgeous ring, and now I have something that I can show people for many, many years, and tell them about the moment it stopped my heart. This is the kind of stuff that makes metal detecting so worthwhile!